William "Bill" Andes Hoyt, 92, of Dayton, died Sunday, March 4, 2018, at his home. Bill was born April 15, 1925, in Maryville Tenn., to the late James Wells and Mabel Ruth Brown Hoyt Sr. In addition to his parents, he was also preceded in death by his wife, Bitsy Sheets Hoyt; sister, Elizabeth Stone Hoyt; brother, James Wells Hoyt Jr., and nephew, Van Tarvin Hoyt. Bill was a graduate of Maryville High School, The University of Tennessee and earned his Masters Degree in Civil Engineering at North Carolina State University. 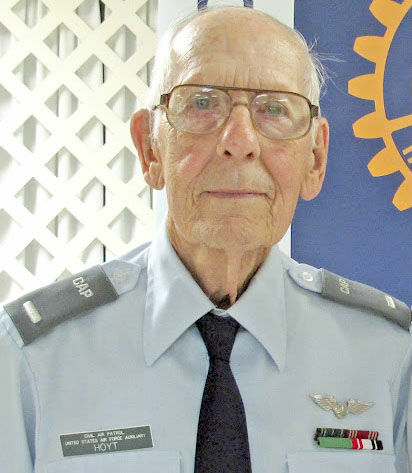 He held memberships in The American Society of Civil Engineers–Chattanooga Chapter; Rotary Club of Dayton; Civil Air Patrol-Rhea County Corporate Squadron; Silver Sneakers (RC3); and was a member of First United Methodist Church of Dayton. He served his country as a private first class with the U.S. Army during World War II in the European Theater. He retired in the Maintenance & Engineering Department at E. I. DuPont after 34 years. He is survived by his daughter, Lace (John) Stevens of Pagosa Springs, Colo.; son, William “Andes” (Susan) Hoyt Jr., of Huntsville, Ala.; grandsons, James Scott (Sara) Stevens, of Lafayette, La., and William Carl (Adrienne) Stevens, of Lafayette, La. ; granddaughters, Jennifer Marie Hoyt and Christina Ruth Hoyt, both of Huntsville, Ala.; sister, Mary Ruth Hoyt, of Maryville, Tenn.; nephew, Rev. Michael Hoyt, of Greeneville, S.C.; niece, Brenda Griffin Hoyt; and four great-grandchildren.